ANTIQUE is a clean, minimal, stylish HTML5 Business Template which is perfect for creating sites under General, Corporate, Creative, Portfolio, Agency, Magazine, Renovation, Blog , Parallax category. It can easily be used as any kind of Landing Pages as well. 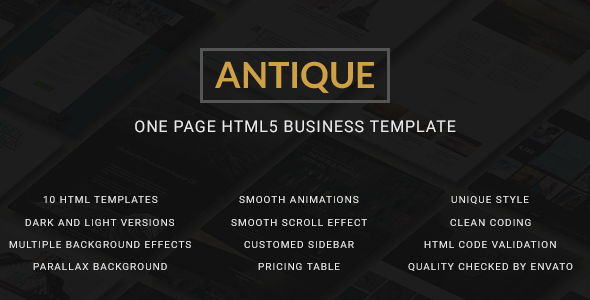 ANTIQUE has two versions 1.Dark and 2.Light version with 10 html templates. Please don’t forget to give “ANTIQUE” a five star if you like it.